If you are looking for garage floor coatings, there is a good chance you did a google search for “epoxy”. Historically, epoxy has been at the leading edge of garage floor coatings, but that is no longer the case. Nowadays, polyurea coatings are a much better option. Here at Garage Force, our patented polyurea garage floor coatings are about 20 times stronger than epoxy coatings. That is a huge difference in strength! 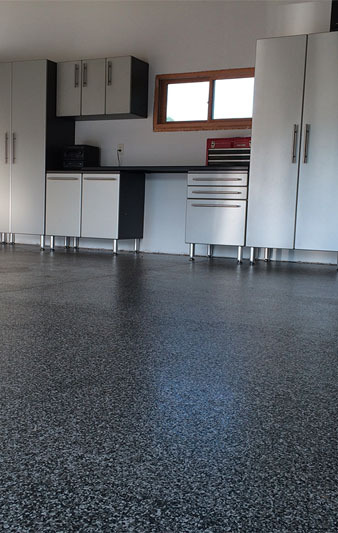 Our garage floor coatings are resistant to damage from ultraviolet light. In contrast, epoxy coatings will yellow and fade after consistent exposure to sunlight. With our garage floor coatings, a second layer is applied that resists moisture from getting into your concrete and causing damage. Polyurea cures at an extremely fast rate, leaving less time for bubbles to form when the material hardens (a problem extremely common to epoxy coatings). Our coatings provide a great-looking finish that also resists stains. In general, the material is also resistant to scrapes, extreme temperatures, and many forms of chemical corrosion. In addition to the above benefits, polyurea coatings have a much quicker installation time, making the process much easier on clients. This is because, as we mentioned earlier, our coatings cure (harden) extremely fast, and are complete within a span of 24 hours. In contrast, an epoxy garage floor coating generally takes three to four days to install. That is an extra two to three days for you to enjoy your new garage floor coating. Additionally, our coatings can be installed in temperatures anywhere between -30 degrees to 140 degrees Fahrenheit. That means except in extreme environments, you can have our coatings installed any time of the year. Epoxy, on the other hand, only has a very narrow temperature window that it can be installed in, making installation impossible except in spring and fall in many states. 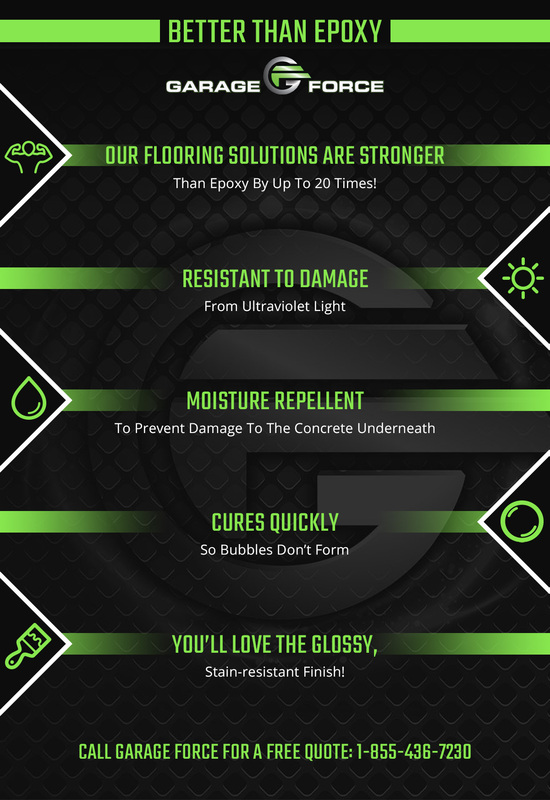 If we haven’t convinced you to consider one of our garage floor coatings so far, check out all of the customization options that we offer. If you are still on the fence, one of our friendly and knowledgeable representatives is available for your call. They will be happy to provide answers to any questions that you might need. You can also reach out to us by email for a free quote from the location nearest you, by clicking here.